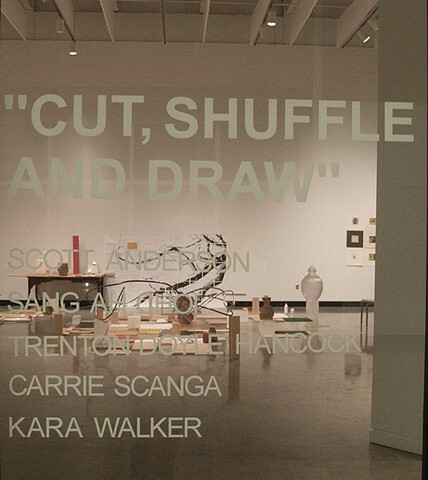 Cut, Shuffle and Draw is a curated exhibition of artists who allude to process by manipulating and creating layers of symbols and meaning on the surface. The infusion of appropriated histories, found objects, or concepts creates a new language. The different approaches of the artists such as collage, silhouette, drawing, or assemblage enhances the complexity of the imagery. When a deck of cards is cut, each player is dealt a different hand. Play, a hybrid of invention and intuition, resides in how the players decide to use the resources that they have been given. The artists in Cut, Shuffle and Draw examine the cards that they have been given- cards that express history, allusion, fiction, process and material. They play their respective hands with wit and insight, leaving space for viewers to enter the game through subjective visual experience. Columbus State University, Department of Art The Norman Shannon and Emmy Lou P. Illges Gallery. Participating artists are Scott Anderson, Sang-ah Choi, Trenton Doyle Hancock, Carrie Scanga, Kara Walker and a collaborative installation by Peter Dudek with the CSU Art Students. The exhibition is open from January 11 to February 13, 2010.